Hanged Man was the first Book of Shadows album, only released in small quantities in 2003, and now reissued by Reverb Worship in an edition of 50 copies. I reviewed this album over 8 years ago so I’m diving in with a fresh ear. The reissue is minus 4 songs from the original release, but includes 3 tracks not on the original that Carlton tells me were from the sessions just prior to Hanged Man, before Aaron Bennack joined the band. Two of the things that make the music so beautiful and interesting are Sharon’s haunting, space whispery vocals, and the contrasting, and sometimes truly odd combinations of music and sounds that the musicians manage to bring together so nicely. The album opens with the The Beach, on which guitars, bass, keys and vocals create a spacey-ambient-wryd-folk brand of haunting beauty. As is the case throughout the album, Sharon’s vocals are mesmerizing, like a spectre looming over the proceedings. Bring Ginger Candy is a Carlton-Sharon duo piece that features a cool and strange combination of lo-fi folk-psych and freaky alien electronics that kind of reminds me of Fit & Limo. I love the combination of beautiful melodies, atmosphere and vocals on Heavens Mirror. I like the shimmering effects that serve as a strange sort of contrasting support to the vocals. It’s hard to describe but sounds really cool. On Keep Sharing, Aaron’s guitar almost sounds like a Western movie theme, and surrounded by Sharon’s one-women choir the effect is yet another example of captivating Book of Shadows combinations. With Krisna we get pulsating electronics that provide spaced out rhythmic-like support to the song, with Sharon going into space whisper mode as she chants “Kriiiiiii-snaaaaaa”. Sacred Grove features more spacey atmospherics, effects and vocals along with some of the most interesting guitar work from Aaron on the album. Free is similar, with space electronics, melodic guitar and space whispery vocals. Samhain is a Carlton-Aaron duo piece. This is quite different because instead of Sharon’s vocals we have Carlton doing spoken word. There’s more interesting guitar patterns and effects along with spaced out keys. But then along with Carlton’s narrative we’ve got a demonic efx’d “almost” voice and what sounds like crunchy metallic guitar chords joining in. And all along Aaron continues with the original guitar theme and Carlton continues speaking. Pretty wild stuff and further evidence of Book of Shadows’ flair for contrasting elements that work together well. Finally, Intangible Smurf is a short track that brings the album to a close. Among the new tracks that were from sessions recorded prior to Hanged Man is Woman Is The Altar, which consists of a repetitive robotic electronic pattern, spaced out theremin, and vocals. As the nearly 10 minute track evolves, the theremin jams while various other noises and effects wander through. Ring Pass Not combines spaced out electronics, guitar and space whispers, and includes Joel Crutcher from ST 37 on guitar. Finally, Common Heart is a Carlton-Sharon duo piece and at 9+ minutes another lengthier track. Experimental space electronics and Sharon’s vocals make for an intriguing combination. I really floated along with this one. On the Cayleper album we get a mixture of Aaron Bennack composed duo and trio pieces, and improvisations by larger Book of Shadows lineups. It opens and closes with brief Sharon-Aaron duo tracks. Earhorn To The Other Side is a droney atmospheric piece with Sharon on vocals and Aaron on drums and flute. Jimmy Turned The Page is one of the most song-like tunes I’ve heard from Book of Shadows, with pleasant melodic guitar. Tran-smitten is another Sharon-Aaron duo track featuring vocals plus folky guitar patterns that are soon interrupted by a brief noisy segment before returning to the original theme. The noise bit didn’t work too well for me as they had a really nice groove going. Zizabah is one of three Sharon-Carlton-Aaron tracks. Nice experimental sounds and soundscapes, and for the last minute they shift gears and go into deep space. Tommy Walked Down The Hall Of Trianglic Energies is a cool combination of church choir/Gregorian chant, ambience, bubbly-blurpy effects, and trip guitar. For ambient/soundscape drift this is one of my favorites of the set. At nearly 11 minutes I Played Crawling Chaos On My Jambox In The Graveyard is the longest track of the set and another highlight. It’s slowly developing with a cinematic feel and conjured up images of a deserted ghost town on another planet. I see tumbleweeds blowing down the dusty street, but the surface is in space. Wow, a simple combination of space whisper/chant vocals, guitar and ambience really got my imagination going. Kresnayarsk is an Aaron solo track, starting off with somber, moody piano, then adding effects which start off as embellishment and later take over the piano. Cayleper also includes four improv tracks with larger Book of Shadows lineups. I like the way the music builds up on the space-noise exploratory Space Tide At The Trailer. Sharon sounds like the witches from the Suspiria soundtrack (which I had been listening to recently so it was fresh in my mind). The vocals get even witchier on The Listening Pilgrim. We’ve got busy sound patterns like bees buzzing around, blowing wind, anguished avant-Beefhearty Blues guitar, and more. Lots of interesting guitar that goes great with the electronics and vocals. 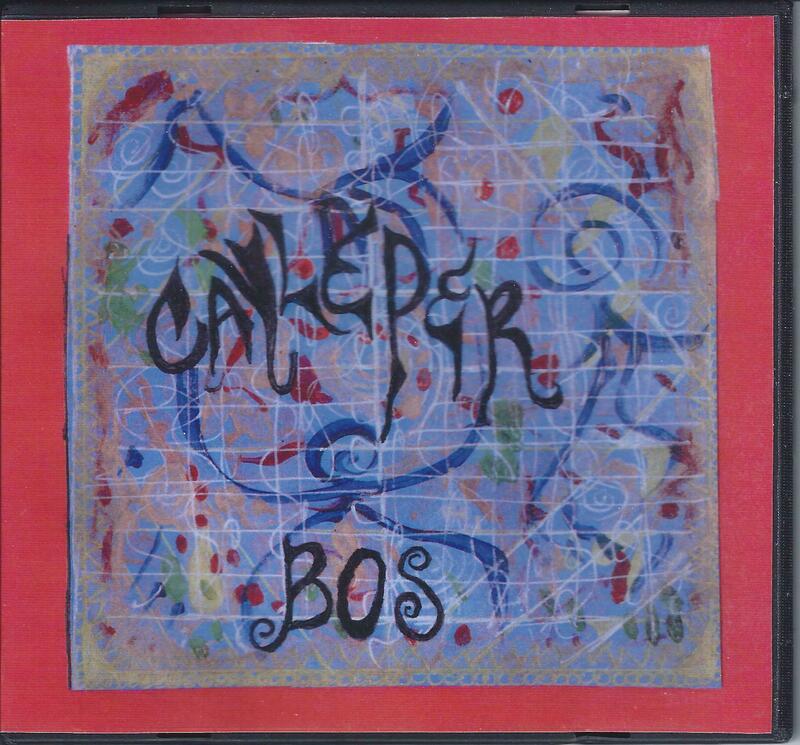 Coming At You Live Leper is the only track without Aaron, but adds Joel Crutcher on guitar. Its starts off as a symphony of noise, with pulsating drones and tortured guitars. Things soon settle down and the band embark on a noise-soundscape-psychedelic segment that gets increasingly intense before receding once again. Experimental free-improv with an atmospheric noise-psych edge. Finally, for Hawkfib we’ve got a 7 musician (4 guitars) Book of Shadows lineup. It starts off with the same noise-symphony feel, with freaked out psychedelic jamming, electric Miles-like funky grooves, and general sound and mood exploration. Lots of interesting variety on this album. 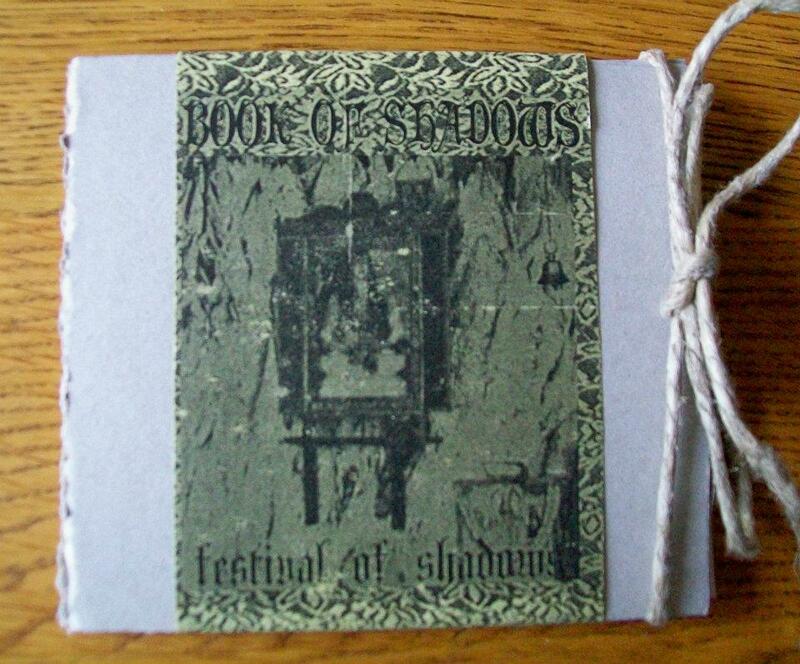 Festival of Shadows is a 2-CDR set released by Lonktaar in an edition of 44 copies. 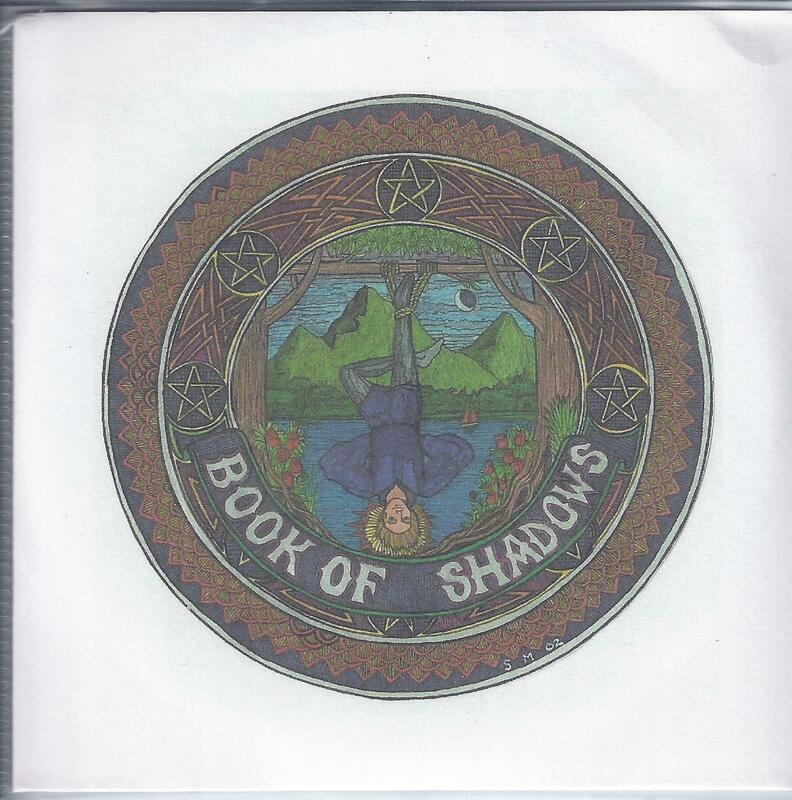 If you liked the previous album descriptions or are already a Book of Shadows fan, suffice it to say this is an interesting and varied collection, so instead of dissecting all 21 tracks I’ll touch on the tracks that stood out for me. Scudder consists of avant-folk acoustic guitar, wailing, rumbling, volcanic electric guitar, vocals and atmospherics. It all gets wild and fun as both guitars eventually start rocking out against a windswept backdrop. Somewhat similar is Never Seen, an interesting combination of strumming acoustic guitar, electric guitar, alien effects and vocals. Never Seen 2 features a similar theme, though in the last couple minutes drums kick in, setting a clear rhythmic pulse, with shimmering liquid psych guitar licks and electronic effects. Cheer Up Charlie is a 19 minute track with three guitars, keys and vocals. It’s relatively peaceful, with the three guitars strumming and playing various spacey effects, backed by soundscapes and Sharon’s fluttering and sometimes banshee-like vocals. They get a groove going at times, which is an interesting contrast with what the vocals and keys are doing. There are some moments when the guitars start to rumble, the drones get louder and it sounds like things might start to get aggressive, but calm is maintained. Lots of good ideas on this one but the musicians aren’t consistently in sync with one another throughout this lengthy track. But Book of Shadows follow it up with Nopalo, a concise 4+ minutes that combines contrasting elements working together seamlessly to create an avant-ambient space trip. At 11+ minutes The First One From Sunday is another longer track. It’s more on the audio-art experimental side, but includes an intriguing mixture of contrasting elements. It starts off as an industrial dirge, morphing into wind effects that sound like being in the frozen tundra. Along with this the vocals howl, the guitars trip along, and electronic effects color the landscape. Closing out the first CD is the 12 minute Gardens of the Ancients. Wow, this was a surprise. Carlton must have had a hankering for his ST 37 roots because that’s what this kind of sounds like. They get a dark bass groove going, add sizzling guitar and a cacophony of space electronics and we’re rocking out in space. Opening the second CD is Psychic Driftwood Dragonfly, a song-like Sharon-Aaron duo track with lulling acoustic guitar and vocals. Aaron pops in with a quick shot of twisted ripping electric acid guitar, then pops in later with brief jamming Bluesy leads, and then again with wildman leads. Aaron gets a little Frippertronic on Ecstatic Tears Of Light, which includes cool loops and guitar leads. The Revenge Of Crash Corrigan is an experimental free-improv piece on which the music moves along steadily and busily, with all the musicians doing their own thing yet it all gels nicely. Later on the music morphs into something more spaced out and psychedelic atmospheric. Red Ochre features a different use of Sharon’s vocals than I typically hear, doing something that reminds me of an old Laurie Anderson tune. River World is a 33 minute improv epic with vocals, keys and four guitars. It all starts off a bit disjointed as the guitars amble along with some trippy avant-psychedelic noodling. After a while it starts coming together as a spacey soundscape/noise-psych sculpture. Pretty cool but it doesn’t flow seamlessly enough for such a long track. But The Magician is a killer closing track. Sharon does spoken word while Carlton cranks out true UFO effects. Scott Telles from ST 37 joins in on keys and Sam Royal contributes drums and mandolin (the mandolin must be heavily efx’d because I can’t detect it). 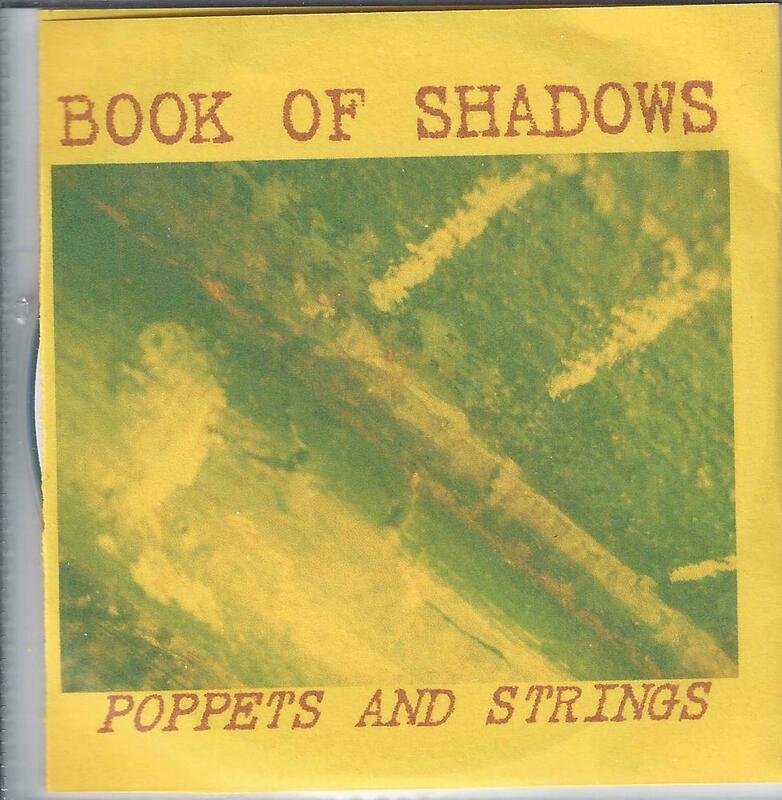 Poppets and Strings is a 3″ mini-CDR released by Kendra Steiner Editions in an edition of 82 numbered discs consisting of two 9 minute tracks. Leander features the trio of Sharon, Carlton, and Brett Humphrey on guitar and electronics. Sharon is in space-whisper-meets-harpy mode, surrounded by haunting space-scapes and trippy guitar. The keys and electronics get really spaced out and the guitar feedback pulsates along with the keys. I like how the music and vocals drift along and the vocals get gorgeously caterwauling along with the more intense musical moments. The title track is a Sharon/Carlton duo piece with both contributing vocals and keys and recalls classic floating space electronica more than most Book of Shadows tracks I’ve heard. Even Sharon’s vocals, while not 360 degrees from what we’re accustomed to take on a slightly different character, though still function as an equally contributing instrument. An excellent deep space meditation.